Located on South 6th, just west of Bedford Avenue, this building was graced with a peeling coat of yellow paint - picturesque in its own right, but nothing compared to the beautiful facade that has been uncovered...The Bedford Avenue Theatre was constructed in 1891 by builder W. W. Cole (the architect is not known). Its inaugural performance featured the actress Fanny Rice in A Jolly Surprise. The theatre's tenure as a theatre was cut short - literally - by the construction of the Williamsburg Bridge. The right of way for the bridge, which was opened in 1903, cut off the back half of the theatre, stage and all. 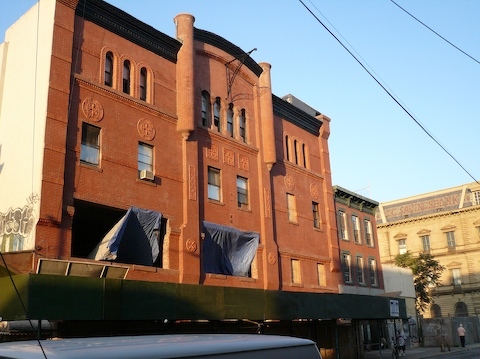 The building has been leased by Maxim, which currently operates a health club in a converted loft building on Driggs Avenue between N. 9th and N. 10th Streets. I'd never been able to get a shot of this building that captured it, and when I saw the scaffolding a few months ago, my first thought was, "Well, now i'll NEVER get this building." What a delight to see that they didn't ruin it.